Since its introduction in 2001 the Nord Electro has been the natural choice for musicians in need of authentic emulations of classical electro mechanical and acoustic instruments in a portable and easy to use package. With greatly expanded memory, the added ability to split and layer and a live focused program section, the new Nord Electro 5 is a highly refined, focused yet flexible stage keyboard. The Electro 5 Organ section features a new additional Principal Pipe Organ model as well as the Tone Wheel simulation and the highly acclaimed Rotary Speaker simulation of a vintage 122 unit from the award winning Nord C2D Combo Organ. The C2D B3 Tone Wheel engine is the result of over a decade of perfecting our tone wheel simulations, a journey that started with the original Nord Electro and followed by the award winning Nord C1 and Nord C2 Combo Organs. Not only have we analyzed the signals from each of the 91 spinning tone wheels inside several original instruments - we have also paid years of attention to each and every one of the intricate details that make up the characteristics of the actual sound in a vintage organ. A new B3 Tone Wheel Bass feature gives you the classic 16' and 8' bass drawbars in the left hand and can even be used with the Piano and Sample section for a thick and meaty bottom. Both the Electro 5D 61/5D 73 feature physical Drawbars and can accommodate the Nord Half-Moon switch with stop/slow/fast modes (optional accessory). The Farfisa* and Vox* models are just as impressive as the B3, simulating the behavior and unique response of the original instruments. The Farfisa Compact Deluxe, considered by many to be the mother of transistor organs, involves routing matrixes and complex filter combinations that offer a tailored sound with massive energy and high-end. The Vox* Continental's brute design brings you a more hollow tone, but with a very intense character. Both these transistor organs have their own unique, irreplaceable personalities. Combine them with any of the Amp simulations, add some distortion, adjust the EQ and they will definitely get you through any organ gig with flying colors. The new Electro 5 series all feature 1GB of Piano Sample memory, allowing you to bring even more of our unique sampled acoustic and electric pianos on stage. The subtle but effective Sympathetic String Resonance technology derived from the Nord Piano is now implemented in the Electro 5 delivering an unprecedented degree of realism to your performance when using our Grand or Upright pianos. The piano section of the Electro 5 contains acoustic and electric pianos from the ever-expanding, and freely downloadable Nord Piano Library. Expertly sampled and brimming with unique character, the Grand and Upright Acoustic Pianos, legendary Electric Pianos, Clavinet and Harpsichord, provide a stunning sound palette. The entire Nord Piano Library is included on DVDs and new additions can be downloaded free on the Nord Piano Library page. Replacing the sounds is simply a matter of dragging and dropping files in the Nord Sound Manager for Mac and Windows. The Long Release feature is suitable for legato playing styles and the Advanced String Resonance feature on Grand and Upright Pianos can be turned off when desired. 4 Dynamic Response Curves are available for customizing the keyboard response to your playing style, including a new softer curve. The new Electro 5 features a dedicated Sample Synth section with expanded memory for the Nord Sample Library (256 MB) and additional controls for attack, decay/release and dynamics (filter/velocity). The Nord Sample Library features a broad selection of free sounds from acclaimed sample producers as well as exclusively licensed sounds of the legendary Mellotron and Chamberlin. The included Nord Sample Editor makes it possible to add any sound you want to your Electro 5. The Sample Editor can use audio files in the .wav format and has great tools to assist you in getting the results you want. 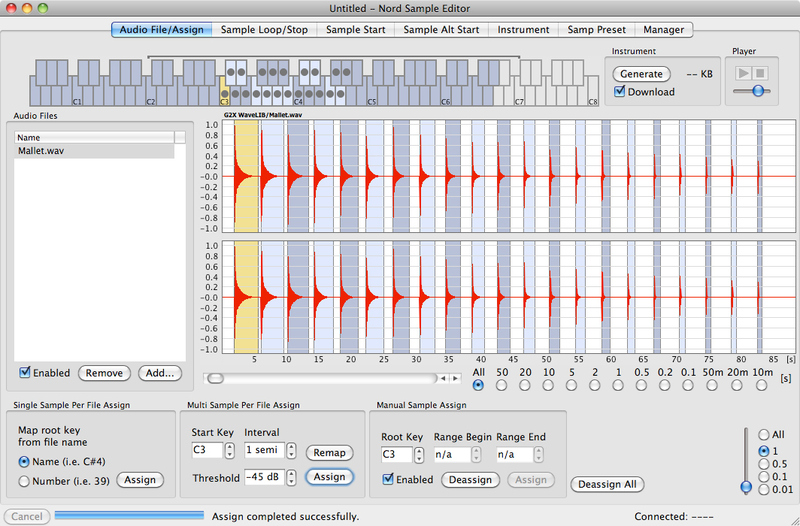 Mapping several samples across the keyboard or creating seamless loops has never been easier. The Nord Electro 5 has 256 MB of memory dedicated to the Nord Sample Library. Our efficient, lossless compression algorithm makes it's possible for us to fit samples up to three times the size compared to standard linear sample players. 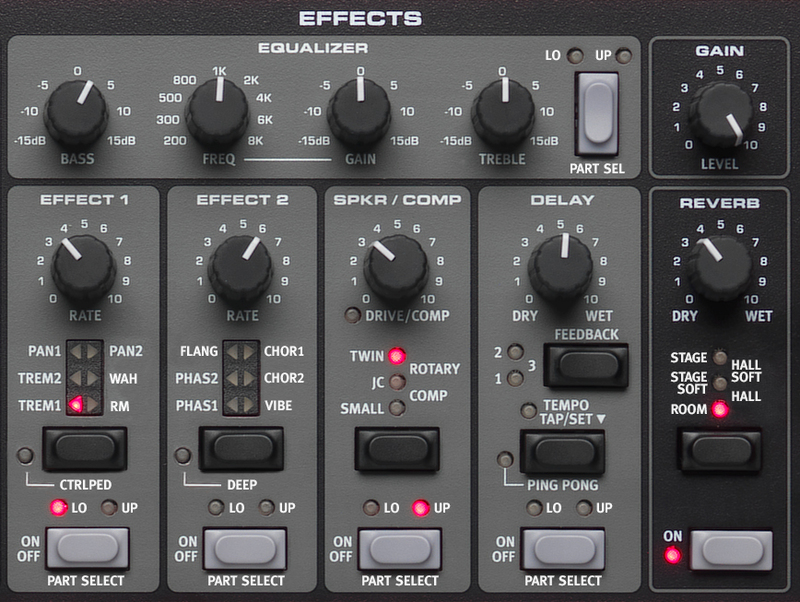 The Nord Electro 5 Effect section features great, tweakable effects for instantly adding some dirt, glimmer or atmosphere to your sound, and all effects are now in Stereo. The Amp/Speaker simulation now features the same Vintage 122 Rotary Speaker simulations as found in our flagship organ, Nord C2D. Also, there's a flexible Stereo Delay effect with Tap-Tempo and Ping-Pong mode. Effect 1 - Pan, Tremolo, Wah-wah and Ring Modulator. All effects can be controlled with a Control Pedal. 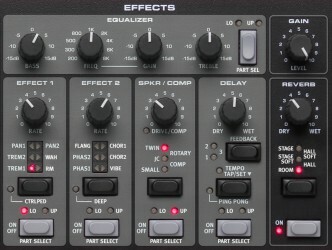 Effect 2 - Phaser, Flanger, Chorus, a new Vibe effect and two selectable depths for each effect. Compressor/Amp - Twin, JC, Small, Rotary and Compressor and a new Tube Overdrive effect. The Nord Electro 5 HP keybed uses amazingly portable weighted hammer action piano keys. Perfect for electric and acoustic piano sounds, but also works great for organ playing. Key range 5 HP: E-E. The Nord Electro 5D 61 and 5D 73 uses Semi-Weighted organ type keys with a rounded "waterfall" tip, brilliant for rapid organ shredding and synthesizer licks, but also plays nice with piano sounds. Key range C-C on Electro 5D 61 and E-E on Electro 5D 73. 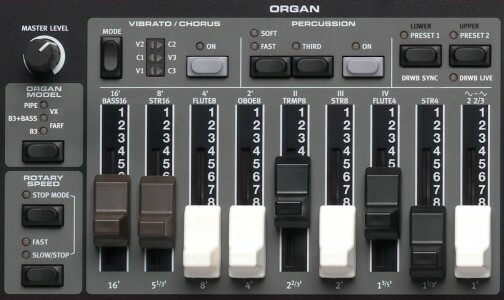 The Nord Electro 5 has two sound slots that can be combined in a layer or split over the keyboard (Organ/Piano, Piano/Sample Synth or Sample Synth/Organ). 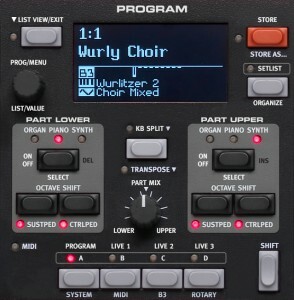 Each of the sound slots can have specific effects, Control Pedal and/or Sustain Pedal assigned to them – for example chorus and Sustain Pedal on the Piano and some Delay and a Control Pedal on the Sample Synth. The split function includes 6 split points, indicated with LED lights. 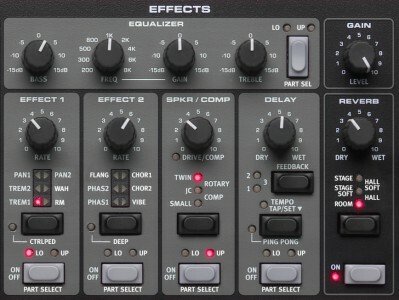 Each of the effects sections can be assigned freely to either Upper or Lower parts. The Electro 5 features a new Set List mode that lets you easily organize a group of Programs for each specific song in the list. Each song can consist of up to 4 different Programs, freely assignable from your existing Programs. You can create unique Set Lists for different bands or situations and the names and order can be easily customized on the fly without connecting it to a computer. The super clear new OLED display offers excellent overview when selecting sounds and editing programs. A new Organize function allows you to effortlessly rearrange the order of Programs and Samples without it affecting your Programs or any Setlists that use them. Just plug your MP3 or CD player to the rear panel monitor input to play along, rehearse to or jam with previously recorded music without the need of an external mixer or sound system. The signal is monitored through the headphone output. Control Pedal support has been improved and now supports the following pedals: Fatar, Yamaha FC7, Roland EV-7, Korg EXP2 and Korg XVP10. The Piano Section has 6 categories - Grand, Upright, EPiano 1 (tine), EPiano 2 (reed) Clavinet and Harpsichord. Each category can contain several different models. 40-60 Voices polyphony for Piano Library sounds. 15 Voice polyphony for Sample Library sounds. 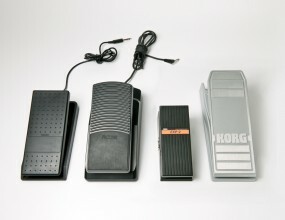 1 Control pedal input - ¼", 6,35 mm TRS stereo jack, like Yamaha FC7, Roland EV-7, Roland EV-5, Korg EXP2 and Korg XVP10. 1 Sustain pedal input - ¼", 6,35 mm jack. Use a momentary pedal, like e.g, Roland DP-2, DP-6, Yamaha FC-4, FC-5, Fatar VFP1-25 etc.